Want a free web server? Want ease of use and advanced functionality? Its small size, low system requirements and easy administration make it the perfect choice for both professional and amateur web developers alike. Disponible en el inglés y el español. No licence fees, time limits or SpyWare included. Can host an unlimited number of web sites, each with their own home directories and security configurations. 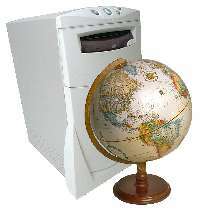 Map different domain names on to one or more web sites. Listen on many ports at the same time. No need to limit yourself to the standard port 80. Implements the latest HTTP standard, 1.1 to provide request pipelining, range downloads and browser cache support for enhanced performance. Works great with PHP, PERL, Python and other scripting languages. For security reasons the running of arbitrary executables is restricted. Implements standard HTTP gzip compression to increase your performance by up to three times. Supports standard file name substitution, such as index.html, if a client only asks for a directory. Directory listings can also be generated automatically using a configurable script to suit your needs. Files are cached in memory for faster performance. Use the pre-defined MIME file associations, or define your own. Define your own server error message format. Supports the two industry standard log file formats, NCSA and W3C. Each web site can have its own request log file and request times can be written in local time or in Greenwich Mean Time. The log files are compatible with the many web server log analysis applications available. Supports addition path info for CGI scripts and a powerful URL re-write rules feature. KFWS was written from the ground up in C++ as a multithreaded Windows application. Supports Windows 98,ME,2000 and XP. It is self contained and requires no external libraries on run-time DLLs, other than those shipped as part of the Windows operating system. Can be installed as a systems service on Windows NT,2000 and XP, for enhanced security and administration. It can be run as a conventional application on Windows 98 and ME. Configure the server through your browser from any machine on the internet. For security reasons this is initially restricted to the local machine, but a simple setting change enables remote administration. The server sits as an icon in your system tray and can be configured to start manually or when you boot up. 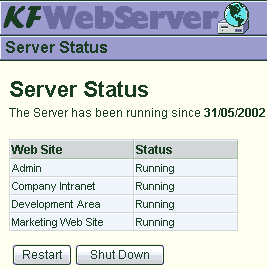 Gives you detailed control over all aspect of the servers operations. HTTP standard Basic Authentication is based on user names and passwords defined within a realm. KFWS supports an unlimited number of realms, each with their own set of users and user groups. Set security permissions at the individual sub-directory level. Gives you maximum flexibility on implementing your security policies. Password failure timed lock outs, to prevent dictionary attacks. Request limits to counter Denial Of Service attacks. Fail safe operation. Only those requests that pass all the security checks, such as a recognised MIME type and an authorised directory will be authorised. Prevents hackers from accessing system files or executing unauthorised applications.